Vibrant, vivacious and joyous Joseph and the Amazing Technicolor Dreamcoat explodes onto the Glasgow stage in Bill Kenwright's perennial touring production of Andrew Lloyd Webber and Tim Rice's timeless musical, their first to ever be publicly performed. Since its premiere on the stage of Colet Court School in 1968 as a 20 minute cantata "Joseph ..." has been expanded over the years to a full blown musical entertainment; its inherent simplicity, catchy pastiche-laden score, humorous lyrics and the familiarity of one of the most famous stories of the Old Testament all coalesce to create one of the most popular pieces of musical theatre ever. In fact there can be few people left in the western world who is not aware of "Joseph ..." or who has not heard at least one of its musical numbers. Tim Rice's lyrical talents are on full show in this production as is Lloyd Webber's inherent melodic knack and Kenwright directs a production that is full of life and wit, almost perfectly complimenting the musical material. "Joseph ..." is certainly Kenwright's most directorially triumphant production, no doubt aided by Henry Metcalfe's choreography which is equally in tune with the comedic, ebullient nature of the show and full of vigour and energy. There are some transitions that threaten to halt the show's flow and which should be worked into the production proper whilst there is also some stage business that is little more than filler - as if to beef up the running time of a show which is, in reality, still a relatively short one. The same could be said of some musical moments where sequences are slowed down unnecessarily causing the rhythm of the show to drag and, where lyrics are sung, potentially damaging some of the many lyrical witticisms of Rice. Sean Cavanagh's design is ostensibly the same that has been used over several decades but it is, in its present incarnation, a more detailed and colourful affair and the lighting of Nick Richings is perfectly attuned to the rich, bright production. The sound design of Dan Samson and the musical direction of Kelvin Towse is also to be complimented and it is unfortunate that Kenwright, again, fails to credit the orchestra given the importance that musicians play in a musical but this oversight is easily corrected and will hopefully be rectified in the near future. Bill Kenwright has assembled a truly top-notch cast for this present incarnation of his most famous production; replete with a high energy, diverse cast who sing and move with gusto. Emiliano Stamatakis makes his UK premiere in the Elvis-inspired role of "Pharaoh" and he is an attractive, engaging performer with plenty of sexual charm appropriate to the part. Lucy Kay, as the "Narrator", stuns with a powerful voice, showcasing a belt worthy of the most hardened of Broadway performers. She imbues the role with the warmth and allure necessary as the story-teller of the evening. Of all the roles in musical theatre Joseph is not the most demanding of acting roles but it is a difficult role to pull off nonetheless as what little he is given has to convey so much; Joseph starts out as an arrogant, vain, pain-in-the-proverbial but he must still be able to attract sympathy from his audience. He must be seen to learn from his experiences and to come to feel empathy and compassion for others. In Joe McElderry, Kenwright has found someone who has a natural charm and likeability matched with a winning personality and affability that is quite perfect for the part. With his naturally pleasing smile and his truly strong vocals McElderry is a performer who engages the audience from the off and his powerful voice belies his stature. This has to be one of the most strongly cast companies in any production at present. Powerful, radiant, energetic and vividly arresting Joseph and the Amazing Technicolor Dreamcoat defies all expectations in a production that rejuvenates a stalwart of the touring scene thanks to a superb cast and a creative team who appear to defy the temptation to rest on their laurels. A wonderfully glorious production! 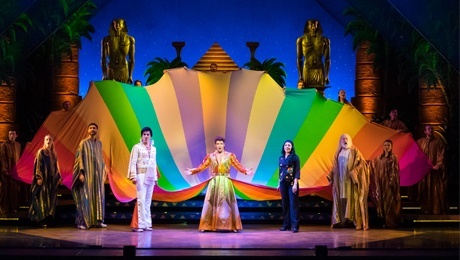 Joseph and the Amazing Technicolour Dreamcoat is at the King's Theatre Glasgow until Saturday 14th May. For tickets and information visit ATG Tickets.